MATAMOROS — Marcos Valencia is a stranger in the country of his birth. The stocky 19-year-old struggles with Spanish, doesn’t know a thing about Mexican history and can’t find a job. He spends his days dreaming of going home to Indiana, where he grew up from age three. But in the eyes of the law, his home is the cartel-infested state of Tamaulipas, Mexico, where he was born. Two and a half years ago, Valencia was living the life of a typical American teenager — a junior at Goshen High School in Elkhart County, Indiana, where he ran track and dreamed of joining the U.S. Marines or the local police force. Then one day in May 2013 his sister called the police after finding their stepfather, a Mexican national with a previous conviction for document fraud, physically abusing their mother, Valencia said. Court records show the stepfather was arrested on domestic violence charges, which included a prior offense and felony abuse committed in the presence of a child under the age of 16. Records indicate he was deported shortly afterwards. His mother spent all their money in a failed attempt to rescue her husband from deportation, Valencia said, and when that failed, she took her five children to Mexico. Now, stuck in Mexico, Valencia regrets ever agreeing to follow her. Had he stayed in Indiana and finished high school, today he would be eligible for a deferred action program President Obama created by executive order in 2012 that allows some youths brought to the country illegally to remain here and receive work authorization. Instead, he’s struggling to learn the customs of a country he only knew in pictures before getting trapped here. Valencia was brought to the United States by his mother, who married American truck driver Daniel Hamby when Valencia was a toddler. Hamby acted as his father during his formative years. Two half sisters, Hamby’s daughters, are American citizens living in Indiana. Valencia said Hamby and his mother split up when he was about six or seven, and his mom later re-married. Valencia doesn’t know his biological father or, at this point, the whereabouts of his mother or deported Mexican stepfather. But he stays in touch with Hamby, who mostly raised him and who made the trek down to Matamoros to visit Valencia in early November, bringing him some money and clothes but little hope for a quick fix to his immigration woes. The first step is to get Valencia a Mexican passport, but it’s taking more time and money than planned. Lawyers have told Hamby it could take years to get Valencia back to the country where he was raised. They’re even exploring the possibility of immigration to Canada for Valencia, where he wouldn’t be so far from home. Hamby said he has no doubt that his former stepson, regardless of what papers he holds, belongs in the United States. When he returned to Mexico, Valencia initially lived near the city of his birth, Altamira, about 300 miles south of Brownsville, Texas. He said the drug traffickers didn’t mess with him because he worked for his uncle, a cell phone repairman. 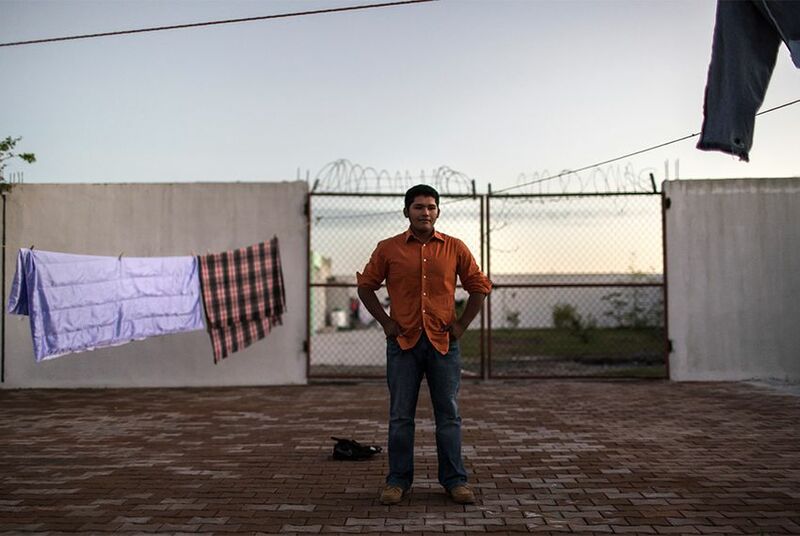 In October he went to Matamoros, across the Rio Grande from Brownsville, with the hope of finding “a way out.” But being within a stone’s throw of the United States geographically didn’t get him any closer legally. With nowhere to stay, Valencia ended up asking for help near the bridge and wound up in a migrant shelter. The director of the shelter said people who stay there aren’t immune from the looming presence of drug cartels, either: Sometimes, cartel members show up at the shelter looking for particular migrants. In November, Valencia left the border to look for work in Mexico City, but he has since returned to Tamaulipas, where he works 9 a.m. to 9 p.m., six days a week, repairing phones and computers for his uncle. The one constant in his life is confusion about his own identity.